The Kurkihar hoard represents a rare set of 226 bronzes, mostly Buddhist, dating to between the 9th and 12th centuries CE, which were found in Kurkihar near Gaya in the Indian state of Bihar. The village of Kurkihar is situated about 5 km. north-east of Wazirgunj, and 27 km east from Gaya. The inscriptions found suggest that Kurkihar was once a well known international pilgrimage center. These include a gilded Avalokiteshvara image from 12th century, referred to as being resplendent. The monastery where the bronzes were found was named Apanakain in an Ashtasahasrika Prajnaparamita manuscript now in LACM. Major Kittoe in 1847, he visited the place twice and on the second visit to the village, spent four days collecting "ten cart-loads of images; all Buddhist and the Tamrika period". A great portion of this collection is preserved in the Indian Museum Kolkata. Cunningham visited Kurkihar in 1861-62 and again in 1879-80. He mentions that the site was about 600 feet square and about 25 feet high. He mentioned having seen here not only numerous Buddhist images, large and small, but a large number of votive stupas. He says there were in his time "row after row of Chaityas extending north to south for several hundred feet". In 1930 a hoard of 226 bronzes and five other objects was found at Kurkihar, which were unearthed from the main mound. These included Buddhas, Bodhisattvas, Stupas, Bells and ritual objects. Today, these objects are displayed in special room in the Patna Museum. Of the 87 images, 81 were Buddhist and 6 Hindu. They were all found in one spot, with the smaller images enclosed in earthen jars. They were found about 25 feet below the surface of the main mound, when someone was digging for bricks. The Sonnery Kurkihar Buddha was sold for US$ 2,806,390 on 3 Oct 2017. 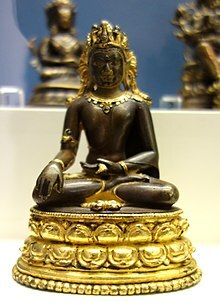 It is roughly contemporaneous with the Atisha period in Tibet (1st half of the 11th century), which initiated a two-century period when Indian bronzes were collected by Tibetans and served as the models of their own early styles. The Sonnery Kurkihar Buddha may have been one such image that travelled to Tibet during the Tibetan Renaissance period. In 2005, for an exhibition in Australia, two of the three statues representing India were from Kurkihar, they were valued at US $30 million. Cunningham has written: "I procured several short but interesting inscriptions at Kurkihar. The name of Sakala is mentioned in several of them, and also Kerala in Dakshinades. The age of these inscriptions, judging from the shapes of the letters, must be about A.D. 800 to 1000"
Ninety three inscriptions have been found on the bronzes. The Kurkihar inscriptions refer to Devapala (810–c. 850), Rajyapala (908–940), Mahipala (988–c. 1036) and Vigrahapala III (1054–1072), ranging from 9th century to 1074 AD. The name of the monastery was apparently named Apanaka, which is mentioned in several inscriptions. The monastery was apparently very popular among the visitors from Kanchi in South India. The names, places of origin and ranks of the donors for 9-12th century have been analyzed. The distribution is 9th century:14, 10th: 21, 11th: 25, and 12th: 10. A circa 1100-1125 manuscript of Ashtasahasrika Prajnaparamita now in LACM. was copied in this monastery during the rule of Ramapala. Kurkihar was apparently a major pilgrimage center located midway between Gaya and Rajgriha and as well an artistic center of brass and stone sculpting. The inscriptions found refer to donors not only from distant place in India like Sakala in Punjab, and Kerala, Conjeevaram or Kanchi in the south, but also from Bali Islands, Malaya as well as other countries. The inscriptions refer to a number of kings, mostly of the Pala dynasty. Kurkihar bronzes have been compared with the bronzes from nearby Nalanda. It has been suggested that Nalanda sculptors may have settled in Kurkihar Kurkihar bronzes data from 10th to 12th cent while Nalanda bronzes cover the period from 7th to 9th cent. nalanda bronzes are reddish whereas Kurkihar bronzes are more yellow. Most of the Kurkihar bronzes are in the Patna Museum. The Hindu temple situated in the north-eastern portion of the village was visited by Cunningham in 1861 where a number of images, both Buddhist and Hindu images, dated to the 10th - 11th Century AD, have been preserved here. On Sept 26, 2006, 18 bronze images from Kurkihar were stolen from the Patna Museum. The thieves entered through a window by cutting the cutting bars. The images were later recovered from a gang including a Vinod Yadav in Nalanda district, and Shahid Warsi of Kolkata. A Manjushri image was not recovered. ^ Banerji-Sastri, "Ninety-three Inscriptions on the Kurkihar Bronzes, Journal of the Bihar and Orissa Research Society, XXVI, 3 (1940), 236-251. TARA: Bronze from Kurkishar, Bihar, dating from 9th century A.D.